Dar es Salaam - A man has been arrested in southern Tanzania on suspicion of attempting to sell his albino wife to Congolese traders, police said on Wednesday. Rukwa regional police commander Isunto Mantage said John Joseph was about to sell his wife Janet for 3,6-million shillings (around R35 000) when caught by a police sting operation. Mantage said the man was caught "after the police set a trap, but the two Congolese traders escaped". The woman told the police she was not aware of her husband's plot but he confessed to having struck a deal with the Congolese. In a spate of gruesome incidents over the past few months, albinos have been kidnapped, killed and dismembered for witch doctors who use their limbs and organs to make lucky charms. The latest victim was a 10-year-old girl, who was murdered and mutilated late last month. At least 27 albinos, mostly women and children, have been killed in different parts of the east African country over the past year alone. "It is utterly stupid for some people to believe that albinos have magic powers and their parts can make them rich," Tanzanian President Jakaya Kikwete told a recent rally by the Tanzania Albino Society (TAS). On Tuesday, two suspects appeared before a resident magistrate's court in Tanzania's central region of Singida for conspiring to kill a six-year-old albino girl. Did a former Beverly Hills doctor use the fat he liposuctioned out of patients to fuel his car? The odd accusation was allegedly made in lawsuits filed by former patients and unearthed by Forbes.com this week. Unfortunately, if he was in fact fueling his car with fat, the practice was illegal, according to California state health officials. An investigation has been launched by the California public health department into the now-closed liposuction practice of Craig Alan Bittner, who once claimed on a Web site that he created "lipodiesel" from his patients' fat and used it to power his Ford SUV and his girlfriend's Lincoln Navigator, Forbes.com. California law apparently forbids the use of human medical waste to power vehicles. Bittner's practice, Beverly Hills Liposculpture, closed in November. Several former patients have filed lawsuits against the doctor, claiming he allowed his unlicensed girlfriend and an assistant to perform procedures, causing mistakes that left the patients disfigured, attorney Andrew Besser, who represents three of the former patients, told Forbes.com. Dans le genre insolite, on peut dire que cette brève du jounrla "Le Monde" se porte là. Selon une équipe de l’école de médecine de Peoria (Etats-Unis) composée de 10 médecins et de 5 étudiants, la célèbre chanson des Bee Gees "Stayin' Alive" serait idéale pour tenir le rythme soutenu d'un massage cardiaque ! Et oui, qui l'eut cru ? En écoutant cette chanson et donc en suivant son rythme, ils ont effectué lors de massages cardiaques effectués sur des mannequins 103 compressions par minute. C'est très proche du rythme "idéal et recommandé" par l'Association américaine du coeur (à savoir 100 compressions par minute). Bref en cas de crise cardiaque ne vous contentez pas de mettre la chanson des Bee Gees, pensez-surtout à appeler le SAMU ! voila.. le Mexique si dangereux! on voit les images de la maison... c'est une porcherie..
on voit le bordel à la maison, les gamins qui sautent partout, l'autiste qui traine dans un coin... combien de super nany pour éduquer ? c'est qu'est incomprehensible c'est que c'est le meme systeme social qui a encourage cela! A Guate par exemple ce type de situation est imposible. Si tu veux faire de la fertilisation in vitro il te faut avoir les moyens pour elever les enfants. pour les adoptions on demande des expertises psychiatriques, financières, etc... pourquoi pas pour les FIV ? The Sears Tower in Chicago, the tallest skyscraper in the Western Hemisphere, is offering visitors a new way to push their fear of heights right over the edge. A set of glass balconies, nicknamed "The Ledge" and suspended from the building's 103rd floor Skydeck, opened on Thursday. The glass is three layers thick, one-and-a half inches in total, and capable of holding five tons. but it doesn't make them any less scary. un medicament qui te protege de la radiation comme Tchernobyl!! A MEDICATION that can protect people exposed to normally lethal doses of radiation from a nuclear or a "dirty" bomb has been developed, reports say. In tests involving 650 monkeys exposed to radiation equivalent to that recorded during the Chernobyl nuclear reactor disaster in 1986, 70 per cent died while the rest suffered serious maladies, the newspaper Yediot Achronot said yesterday. Of the group given anti-radiation shots, almost all survived and had no side effects. A test on humans not exposed to radiation showed none suffered side effects from the medication. The medication was developed by Andrei Gudkov, chief scientific officer at Cleveland BioLabs in the US. Also involved was Israel's Elena Feinstein. 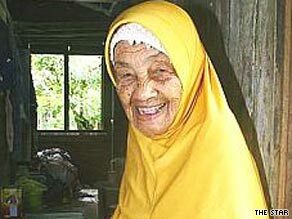 (CNN) -- Afraid that her husband will leave her for a younger woman, a 107-year-old Malaysian woman is looking to marry again -- for the 23rd time. Wok Kundor: "I am an aged woman. I don't have the body nor am I a young woman who can attract anyone." Wok Kundor has been happily married for four years to her husband, a man 70 years her junior. But since he left their village in northern Terengganu state for a drug rehabilitation program in the capital, Kuala Lumpur, Wok has had a gnawing feeling. "She said that she has been feeling insecure lately and she needs to find out whether he still loves her or not," said R.S.N. Murali, a reporter for The Star. The English-language Malaysian daily was among several local media outlets reporting on the lifelong romantic. "She is worried he might not come back after his program and find himself a younger wife," Murali said. If so, Wok has her eyes set on a 50-year-old man, but hopes it does not come to that. "I realize that I am an aged woman. I don't have the body nor am I a young woman who can attract anyone," she told the newspaper. "My intention to remarry is to fill my forlornness," particularly during the Muslim month of fasting, Ramadan, she said. Malaysian media, which has previously reported on the woman, said Wok has been married 22 times. That would make her marriages last an average of four years. Wok would not discuss past relationships, Murali said. "Some of her better halves have passed away or have divorced, but she doesn't want to talk about them or her children," he said. Wok and her current husband, Mohammed Boor Che Musa, hail from the same village and met there. Muhammad, 37, was quoted in an earlier report as saying the couple fell for each other because it was "God's will." On Monday, he told The Star that he is still very much in love with his wife and cannot dream of life with someone else. But Wok wants to hear him say it, Murali said. il y en a trop de centrales en Suisse? de ce cote ca fait envie de demenager a l'Amerique Latine! et si cela etait vrai.. pourquoi on n'a pas donne plein de iode aux gens qui travaillaient a Tchernobyl?! non mais.. je n'y crois pas! j'espere que bientot on va changer tout ca car je deteste l'idee de la nucleaire... Mais bon, je viens d'un pays ou cela n'existe pas donc je n'avais meme pas y pensé! argh!! argh!! argh!!! vous avez donc votre quota d'hypocrisie Francaise alors!